Training and showing of Arabian and Half Arabian performance horses, specializing in saddleseat. Arabian, Half Arabian, Half Hackney, and colored horses for sale, California. Arabian breeder specializing in Russian/Polish bred Arabian horses. Includes pedigrees, awards, horses for sale, and related links. Discussion list formed to preserve and promote the qualities valued by the early breeders of Arabian horses in America and to ensure that horses with those same attributes will be available for future generations. Breeding and training Arabian and half-Arabian reining and Western pleasure horses. In Rogers. Raising Arabian and Half-Arabian horses for show or pleasure. Mentors for Arabian Horse America. Gilbert. Al Khamsa, Blue Star and Babson Arabian horses for sale. Photos and articles. In Hillsboro. Midwest Arabian farm focusing on the breeding of nationally recognized horses. In Minnetonka. Training facility for Arabian and Half-Arabian show horses competing in performance classes. A discussion list for those interested in the American Foundation Arabian Horse Association, the original American Arabian Horses. Specializing in Pinto Arabian, half-Arabian, and Arabian horses of Crabbet, CMK, Polish and Egyptian bloodlines. Foals for sale and stallions at stud. In Copper Canyon. Breeding Arabian and Andalusian/Arabian horses for endurance. Also rescue horses of all breeds, restore their health and sell them to responsible owners. In Caldwell. Specializing in CMK Arabian horses. In Sanger. A small ranch dedicated to the preservation of the desert bred Arabian horses for their beauty, endurance, intelligence and loving disposition. In Jonesville. Native Costumes for the Arabian and Half-Arabian show horse and rider. Lists winners wearing their costumes and shows photos of riders and horses together dressed in their finery. Breeding Arabian Horses for more than 20 years. Training and sales of Purebred Arabian, Hackney Horses and Half Arabians for the show ring and pleasure. Standing Hucks Premier V and Chambord Donti (AHHS) in Olympia. Breeding, training, and sales of Arabian and Arabian crosses. Specializing in Dressage and Sport Horses, as well as Hackney/Arabian crosses for English Pleasure and Park. Half Arabian Pinto horse registry promoting spotted Arabian horses. Sale, farm and breeder listings. Arabian, NSH, Part and Half Arabian Horses for Sale. In Trafalgar. Offering Straight Egyptian Arabian horses. In Ooltewah. Offering Arabian horses for sale or stud in Collierville. Arabian horse sanctuary and home of Anchor Hill Azrak. In Fair Gove. Offering premier Arabian and half-Arabian show horses, training and lessons. In Yelm. Breeders of Arabian and Arabian-bred horses. Standing black Egyptian stallion with stock for sale. Offering Arabian, Half-Arabian and National Show Horses that are athletic and user-friendly. In Coalville. Egyptian Arabian Horses: standing Ansata El Shahraf. Plus Arabian classical fine art and portraiture. Cove. If the business hours of Misty Ridge Farm in may vary on holidays like Valentine’s Day, Washington’s Birthday, St. Patrick’s Day, Easter, Easter eve and Mother’s day. We display standard opening hours and price ranges in our profile site. We recommend to check out mistyridge-arabians.com/ for further information. 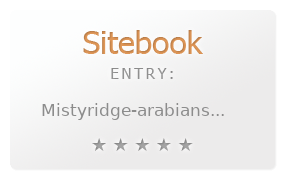 You can also search for Alternatives for mistyridge-arabians.com/ on our Review Site Sitebook.org All trademarks are the property of their respective owners. If we should delete this entry, please send us a short E-Mail.